Michael Servetus was born in Villanueva in Spain in 1511. He was the son of the local judge. He lived at a time when there was unrest in the established Church, and in a period when everyone was questioning the nature of Christianity. As he grew older and more informed, the young Servetus was appalled by the shedding of blood by the Christians towards the Muslims and Jews. Imagine his excitement when, upon examining the Bible more closely, he found that the doctrine of Trinity was nowhere a part of its teaching. He further discovered that the Bible did not always support what was being taught by the Church. Michael Servetus wrote to the leaders of the Reformation, Calvin and Luther, in the hopes that the Protestant movement will turn Unitarian. Alas, the minds of the leaders of the Reformation were still trapped in the false metaphysics. He found that both Luther and Calvin will have nothing to do with his belief in the Unity of God. 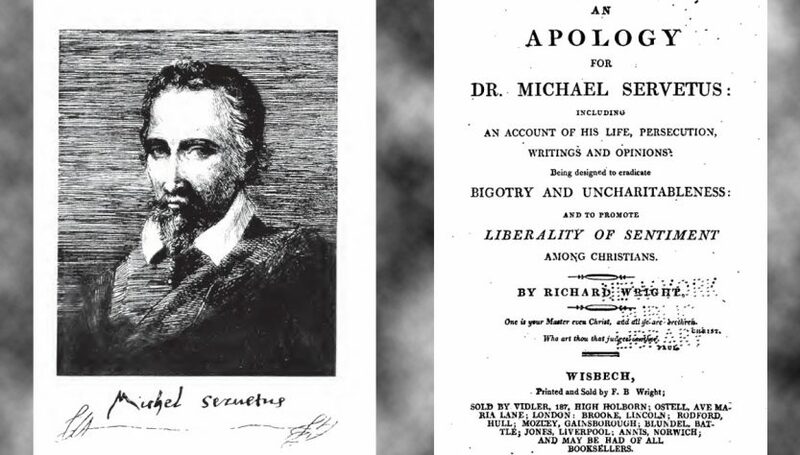 Servetus travelled to look for those who were open-minded enough to listen to what he was sure was the true Christianity as taught by Jesus, and even had a correspondence with Calvin. However, all his attempts to influence people by personal contact failed. Severtus later proceeded to publish his views in a book which he called “On The Errors of Trinity“. The result was that the Church hounded Servetus from one place to another. Servetus was later captured in Geneva, found guilty of heresy at his trial, and was executed by being tied to the trunk of a tree and burned on the 26th of October, 1553. The philosophers have invented a third separate being truly and really distinct from the other two, which they have called the third Person or the Holy Spirit, and thus they have contrived an imaginary Trinity, three beings in one nature. But in reality, three Gods, or one threefold God, are foisted upon us under the pretence, and in the name of Unity…For with them it is very easy, taking the words in their strict sense, for three beings to exist, which they say and yet strictly, simply, and really, so different or distinct yet one is born of another, and yet all these three are shut up in one jar. Since I am unwilling to misuse the word Persons, I shall call them the first being, the second being and the third being, for in the Scripture I find no other name for them…Admitting, therefore, these three, which after their fashion they call Persons, they freely admit a plurality of beings, a plurality of entities, a plurality of Essences, a plurality of substances, and taking the word of God strictly, they will have a plurality of Gods. If this is so, then why the Tritorites are blamed, who say that there are three Gods, for they also contrive three Gods or one threefold one. These threefold Gods of theirs form one composite substance. And although some will not use the word implying that these three have been put together, yet they do use a word that they are constituted together and that God is constituted out of three beings. It is clear therefore that they are Tritories and we have a threefold God. We have become Atheists, man without any God. For as soon as we try to think about God, we are turned aside to three phantoms, so that no kind of unity remains in our conception. What else is being without God but being unable to think about God, when there is always present to our understanding a haunting kind of confusion of three beings, by which we are forever deluded into supposing that we are thinking about God…They seem to be living in another world when they dream of such things for the kingdom of heavens knows none of this nonsense and it is in another way unknown to them, that Scripture speaks of the Holy Spirit. How much this tradition of Trinity has alas, alas! been the laughing stock of Mohammedons only God knows. The Jews also shrink from giving adherence to this fancy of ours, and laugh at our foolishness about the Trinity, and on account of its blasphemies, they do not believe that this is the Messiah promised in their Law. And not only the Mohammedons and the Hebrews, but the very beasts of the field would make fun of us, did they grasp our fantastic notion, for all the workers of the Lord bless the One God…This most burning plague, therefore, was added and superimposed, as it were, on the new gods which have recently come, which our fathers did not worship. And this plague of philosophy was brought upon us by the Greeks, for they above all men are most given to philosophy; and we, hanging upon their lips, have become philosophers, and they never understood the passages of the Scriptures which they adduced with regard to this matter. Some are scandalised at my calling Christ the prophet because they happen not themselves to apply to him the epithet, they fancy that all who do so are chargeable with Judaism and Mohametism, regardless of the fact that the Scriptures and ancient writers call him the prophet. The writings of Michael Servetus’ On The Errors of the Trinity certainly shows that there are those who call themselves Christians and are yet not blinded by the faults of the Trinitarian dogma. One would no doubt wonder why the Church resorted to persecuting Michael Servetus and his anti-Trinitarian writings instead of debating about it in a scholarly manner if the Church is certain that the doctrine is undisputable and is indeed an inherent part of the Christian faith. Unfortunately the remarks of this 16th century scholar has dramatic categorical errors in the sense that it sees the new testament writings in the light of the very worldviews that disagree with it. For in such way He represents the Trinity is that of error. The way He knows of the trinity is not pointed by the very things in scripture but rather he is trying to apply a worldview that falls away from the scriptures. For when applying the premise “misusing the word persons” he is actively ignoring the very definition of the Trinity for within the circular reasoning of his argument, by doing so, he is forcing the the doctrine to fall within itself. It is quite shallow and unfair, the way he is able to put constraints on the use of “Persons” without a reason but just a cheap way to attack a worldview that he unfortunately does not understand and represents unfairly. Poor arguementation. Yes,I agree with Bismika Allahuma,That Jesus or Joshua was another Prophet of God.He definitely wasn’t a son of the Almighty whatsoever. He has been always a peace maker,and he didn’t want to start any kind of rebellion against the Roman Occupiers of Judea.Instead he drew huge crowds, wherever he travelled and served mainly in Galilee area.At times he went to Jerusalem,and there, he had arguments with the ruling classes of the Temple,disagreeing at the way they have been behaving towards the poorer people of the city. There had been cases where some of the Roman Soldiers had ended up going A.W.O.L.by leaving the army and following him instead.Because they were so impressed by the way Jesus always talked about peace instead of an uprising against Rome.So in a way, he did upset the Roman Military Establishment by slowly depleting their army of soldiers in Judea and the Galilee. Christian scholars today readily recognize the fact that for the first three decades C.E., “Christianity” remained a sect within Judaism and that the first fifteen Bishops of Christianity were circumcised Jews who worshipped in the synagogues of the Jews. We have seen how it was only after the introduction of Christianity to the Romans and the official “guardianship” of the Roman empire of the religion of Jesus that it began to see many of the “truths” of the mission of Jesus which were hidden from the very first apostles of Jesus . We have seen how the “Trinity,” the birth of Jesus on the 25th of December, the Easter festival and many other founding doctrines of Christianity were not recognized to be the “truth” until after the religion of Jesus was adopted by those people who for many centuries before that had been spoon fed the doctrines of “Trinity,” “savior from sin,” “incarnation of the Almighty,” “death and resurrection,” Christmas and Easter, “three days and three nights in hell,” “only begotten of the almighty,” “killed by the enemy,” and many other matters which were later “inspired” to them by God in order to be “clarified” in the Bible so that they could be seen clearly. The great and elect messenger of Allah, Jesus the son of Mary (peace be upon them both), is innocent of these pagan innovations which have been foisted upon him after his departure by those who did not fear God. He was a true messenger of God and would never dare to say otherwise. God is One. Period!. He is indivisible and inseparable. There is no God but He. He has no sons nor any equal. He does not hold mankind responsible for the sin of others, but only for their own worship. And God alone shall be the final judge of all of mankind on the Day of Judgment. There are many other parallels that could be brought up in this comparison. However, we can not get into the details here, therefore, it shall be left up to the interested reader to read about them in the books mentioned above, or in the book “Mohammed A Prophesy Fulfilled,” by H. Abdul Al-Dahir, which I recommend highly.